Photographing aspens is actually more involved than I initially thought. I thought, just point the camera at the scene with adequate shutter speed and aperture and, Bamm, you’re done. Not quite. And trust me, I’m a long way from being a master at this, but it’s good to have a grove that you can actually see through instead of the dark dense forest often found. This seems to give the scene a lighter more cheerful feeling. And, even better if you can see blue sky through the grove since the colors yellow and blue are complimentary. You should also be close enough that you don’t need a telephoto lens which can cause the scene to collapse onto one plane; if you are close enough to use a normal lens, the distance to the various trees is better reflected in the image. All this I learned after shooting literally hundreds of these shots one week in the Colorado high country and studying the resulting disappointing images. I’m not sure why I find this image compelling but it seems to have most of the qualities mentioned above, although more blue wouldn’t hurt. 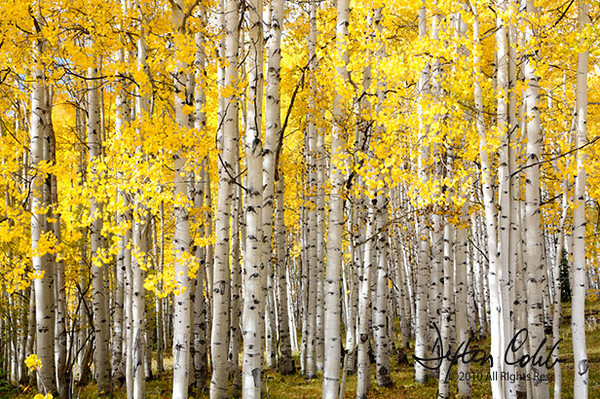 This is a lovely image of a bright aspen grove at peak fall color. A polarizer was used in this image.